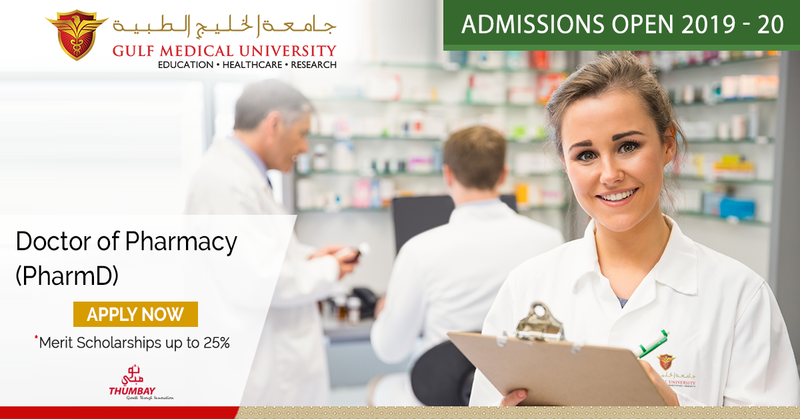 The Doctor of Pharmacy program at Gulf Medical University (GMU) is the first and only PharmD program in the country. The aim of the program is to prepare and graduate professional pharmacists who are drug therapy experts. Starting with a solid foundational knowledge base in biomedical and pharmaceutical sciences in the initial phase, students quickly and smoothly move into the pharmacy practice and clinical pharmacy phase of the program. Professional skills labs offer an opportunity for clinical simulations and roleplay preparing our students for early exposure into the “real practice” environment. The Doctor of Pharmacy program offers GMU students both introductory and advanced pharmacy practice experiences in GMU affiliated hospitals, clinics and community pharmacies. Despite the large number of healthcare facilities that are affiliated with GMU, the College of Pharmacy has developed key partnership with other hospitals including Cleveland Clinic Abu Dhabi and Sheikh Khalifa Bin Zayed Hospital Ajman. These diverse experiences in such advanced healthcare practice environments provide our graduates with the needed pharmacy practice skills required to succeed as they move on to be professional pharmacy practitioners anywhere in the world. Introductory and Advanced Pharmacy Practice Experiences (APPE) is the most extensive and rigorous as compared to other pharmacy programs in the country. These experiences amount to a total of 1640 contact hours in affiliated and partner healthcare facilities in UAE and abroad. These experiences are modeled after North American PharmD programs in a well-structured manner with specific activities aiming at attaining specific skills and competencies that relate to the overall program learning outcomes. Select students have the opportunity to do one of their APPE courses in one of our partner institutions in the United States e.g. Virginia Commonwealth University, the University of Saint Joseph in Connecticut and others. Our PharmD students engage in undergraduate research with their faculty supervisors and present their research at national and international scientific conferences. Their work is published in peer-reviewed reputable international scientific journals. Select students are given the opportunity to undergo a summer research internship at one of our partner institutions in the United States e.g. Virginia Commonwealth University. In our continuous endeavour to improve the quality of our pharmacy program, the GMU Doctor of Pharmacy program is currently undergoing international accreditation (certification) by the American Accreditation Council for Pharmacy Education (ACPE). To graduate practice-ready pharmacists who will advance the profession. To apply international best practices in quality of pharmacy education including student-centered learning, integration of sciences, research and extensive experiential education. To promote collaborative professional practice through inter-professional education. To enhance the quality of healthcare provided by graduates to the community they serve. To prepare graduates for continuing professional development and life-long learning. The curriculum philosophy of the college is aligned with the mission of the College. The curriculum focuses on the achievement of program learning outcomes (PLO’s) designed to graduate competent and socially accountable pharmacy professionals. The PLO’s are categorized to knowledge, skill, and competency domains as per national standards and are aligned with international standards; CAPE educational outcomes in PharmD and ACCP clinical pharmacist competencies for MCP programs. The curriculum provides students with a balanced learning of general education, biomedical, pharmaceutical, and clinical sciences. Integration of these sciences using didactic and experiential education with patient-focused, student-centred approaches provides progressive achievement of PLO’s. Methods utilized to facilitate student learning include lecture, case studies, simulation, written assignments, reflections, presentations, and formative, summative and clinical examinations. Upon successful completion of the curriculum, graduates are prepared to be responsible, lifelong learners who can practice as entry-level pharmacist practitioners in any setting. The programs promote scholarly activities and advancement of professional roles with national and international partnerships. Community engagement activities and inter-professional education prepare students towards socially and professionally responsible. These broader and real-world approaches help students to plan their practice models that fit well in the context. The curriculum is dynamic to undergo changes to improve effectiveness with feedback from students, faculty, preceptors and other stakeholders. Quality assurance measures are used in the continuous quality improvement of the curriculum. All applicants must complete 17 years of age on or before the 31st of December in the year of admission. The applicants from UAE education system offering Advanced Track/Stream or Abu Dhabi Education Council criteria must have secured an overall average of 75% or above marks as per UAE Secondary School Education Standards and should have scored an aggregate score of 65% or above in Biology, Chemistry, Physics / Mathematics in the 12th Grade. (Advanced Track/Stream or Abu Dhabi Education Council criteria) The student should secure an overall minimum score of 75% (C Grade)and above in the 12thGrade. · An aggregate score of 65% or above in Biology, Chemistry, Physics / Mathematics in the 12thGrade. The student should secure an overall minimum score of 65% (B Grade) and above in the 12thGrade. · An aggregate score of 55% or above in Biology, Chemistry, Physics / Mathematics in the 12thGrade. Indian Central Board/ICSE The student should secure an overall minimum score of 60% (B Grade) and above in the 12thGrade. · An aggregate score of 50% or above in Biology, Chemistry, Physics / Mathematics in the 12thGrade. Bangladeshi Board The student should secure an overall minimum score of 60% (B Grade) and above in the 12thGrade. · An aggregate score of 50%or above in Biology, Chemistry, Physics / Mathematics in the 12thGrade. USA American Diploma The student should secure an overall minimum score of 75% and above. SAT (Chem /Math) should be cleared. If Biology is not taken in 12th Grade, SAT (bio) with score of above 400 is required. Applicants from any other non-UAE educational systems not listed above must have secured a minimum aggregate score equivalent to UAE 75%or above as per International Grade Conversion Table published by WES. All applicants shall be evaluated for cognitive and non-cognitive traits demonstrating their aptitude for the chosen area of study by the Admissions Committee which includes Multiple Mini Interviews (MMIs) and personal interview. Admission is finalized on a competitive basis. A1. Describe the physicochemical properties, structure and use of drugs obtained from natural and synthetic sources. A2. Explain the techniques involved in drug manufacture with special emphasis on design, formulation, quality control, quality assurance and good manufacturing practices (GMP). A3. Describe the profile (mechanism, pharmacological actions, dose, dosage regimen, pharmacokinetic properties, interactions, adverse reactions, contraindications etc.) of prescription and nonprescription pharmaceuticals. A4. Overview the therapeutic applications, safety profiles and reported herb-drug interactions of commonly used complementary and alternative medications. A5. Explain the principles of pharmacotherapeutic disease management and pharmaceutical care. A6. Integrate knowledge of basic, biomedical, pharmaceutical, and clinical sciences in the management of the disease. B1. Perform/interpret qualitative and quantitative tests for quality control and screening of pharmaceutical products using modern analytical techniques. B2. Collect and organize relevant monograph data for the hospital formulary and dispense based on therapeutic principles and pharmacoeconomic considerations. B3. Collect, critically evaluate and interpret literature and develop evidence-based therapeutic treatment advice. B4. Participate actively and make recommendations in the pharmacotherapeutic decision-making process. B5. Monitor patients for adverse effects and develop strategies to manage and ultimately prevent future adverse experiences. B6. Identify, resolve and develop strategies to prevent all drug-related problems in patients. B7. Evaluate drug utilization pattern in the pharmacy practice setting. B8. Apply advanced professional communication skills for interaction with patients and other healthcare providers. B9. Design, conduct and disseminate research activities. C1a. Demonstrate professionalism in following the law and ethical standards in the appropriate area of practice. C1b. Identify the responsibilities of the pharmacist in both product and patient-oriented services. C2a. Dispense prescriptions appropriately and accurately. C2b. Monitor and counsel patients to ensure desired therapeutic outcomes. C2c. Demonstrate considerations to cultural diversity and social manners. C2d. Develop and implement a pharmaceutical care plan. C2e. Participate in community healthcare programs and contribute to the development of the healthcare system. C2f. Participate in professional governance and policy formulation while considering issues affecting the profession of pharmacy. C2g. Engage in collaborative and interdisciplinary approaches and teamwork for improving patient outcomes. C3. Engage in self-assessment and self-directed learning, so as to acquire the necessary knowledge, skills and maintain one’s competence. Only students with CGPA of 3 and above at the end of 4th year will be permitted to opt for elective training at sites outside Thumbay Hospitals. The Program Learning Outcomes (PLOs) are aligned with the Qualifications Framework of UAE and the Center for the Advancement of Pharmacy Education (CAPE) Educational Outcomes. Thus, the PLOs of the PharmD program at Gulf Medical University is aligned to produce practice-ready pharmacy professionals with national and international standards. Study plan duration is 5 years including one summer term (one month) after each of years 2 & 3 and a summer term (2 months) after year 4. *Include communication and drug information skills and other Pharmacist skills relevant to general healthcare topics covered. *Include renal diseases, acid/base disorders, clinical nutrition, autonomic nervous system, pulmonary diseases, hematology, immunology and rheumatology. The lab includes an integrated case-based learning. **Include physical assessment and other Pharmacist skills relevant to DPH 220 Integrated Pharmacotherapy topics covered. *Include endocrine and cardiovascular systems. The lab includes integrated case based learning. **Include physical assessment and other Pharmacist skills relevant to DPH 310 Integrated Pharmacotherapy topics covered. *Include cardiovascular systems, neurology diseases and psychiatric disorders. The lab includes an integrated case-based learning. **Include physical assessment and other Pharmacist skills relevant to DPH 320 Integrated Pharmacotherapy topics covered. *Include oncology, hematologic malignancies, hepatic disorders, GI disorders, women’s and men’s health. The lab includes an integrated case-based learning. **Include physical assessment and other Pharmacist skills relevant to DPH 410 Integrated Pharmacotherapy topics covered. *Include infectious diseases. The lab includes an integrated case-based learning. **Include physical assessment and other Pharmacist skills relevant to DPH 420 Integrated Pharmacotherapy topics covered. A total of 10 rotations (6 compulsory and 4 electives) and Clinical Seminar (Academic half day every 2 weeks throughout APPE). Total credit hours of 42 (APPE 40 and Clinical Seminar 2). Total contact hours in APPE is 1600 hours. The course provides an intensive instruction in the writing process focusing on the organization of ideas in well-developed paragraphs with some emphasis on developing vocabulary. It prepares students for expository and argumentative essays. The course emphasizes on important skills that enable the student to communicate effectively in their role of patient care and education as well as in their work place. It ensures professionalism, efficacy and productivity. This will help the students to learn the knowledge, skills and practice, lay the foundation for clear communication as well as for development of a trusting relationship in formal hospital settings. Activities will emphasize on basic communication skills such as writing official documents and presenting with strategy, knowing your audience and tailoring your messages to fit the role, knowing ethical and cultural guidelines as well as developing a stronger interpersonal communication through decoding verbal and non-verbal questions and resolving conflicts effectively. This course aims to develop effective literature search, scientific writing and presentation skills. It intends to enable the students to understand the various types of scientific literature available, perform an effective literature search, write a review on a scientific topic, prepare effective tables and graphs and present effective oral and poster presentations. The student will be made aware about plagiarism as well. The course aims to the learner to the concepts and beliefs in Islam that form the basics of Islamic culture. The students are expected to identify the differences, compare values and preferences in Islamic culture with the existing ones. The course consists of a general review of Islam as a religion and as an approach to life. The objective of this course is to enable the student to demonstrate awareness of the effects of culture upon interpersonal communications and to interact appropriately to the culture of the colleague/patient. The course covers topics related to the different chemical reactions, measurements and figures, electronic structure and periodicity. The chemical bonding, molecular forms, intermolecular bonding and forces are also discussed. In addition to the physical and chemical properties, emphasis is given to topics like acids and bases, chemical equilibrium and radioactivity. The course also includes common organic reactions with emphasis and focus on the chemical bonding, nomenclature and different reactions of alkanes, alkenes and alkynes. This course integrates knowledge of both the anatomical structure and physiological functions of the human body. The anatomy of the different systems; muscular, integumentary, endocrine and nervous system in general are discussed. The course also includes the structure and function of the normal cell; tissues in general, their different types, microscopic characteristics, locations, distribution and functions in the human body and of the different organ systems and their respective roles and functions in the organization of the body. The physiology is integrated with anatomy for each system of the human body. Topics which are covered in detail include the organization, regulation and function of the muscular, integumentary, endocrine and nervous system. This course is designed to introduce features of the healthcare system in the United Arab Emirates. Historical improvements that happened in the health professions are discussed. The course also covers a comprehensive overview of key features of public health and disease prevention. It also explains different roles of healthcare team members as an introduction to Inter-Professional Education. The course provides the students with a wide background in physical pharmaceutical principles essential for their pharmacy study in the next years. The course aims at introducing important pharmacy related physical principles in areas such as states of matter, solubility and distribution, Surface and interfacial phenomenon, phase equilibrium and phase rule, solutions of electrolytes and non-electrolytes, adsorption, buffers and isotonic solutions and rheology. The course also presents basic understanding of particle size as it applies to pharmaceutical sciences. The pharmaceutical organic chemistry course is aimed to present fundamentals of certain topics in organic chemistry and applications in a brief and suitable manner related to the pharmaceutical field of study. It covers the pharmaceutical importance of functional groups aliphatic and aromatic hydrocarbons, alkyl and aryl halides, alcohols, ethers and epoxides, phenols, amines, carboxylic acids and esters, and heterocyclic compounds. The course will emphasize the pharmaceutical importance of these functional groups, their molecular structures and properties, classification, structure, conformations, nomenclature, physical properties, preparation and reactions. The course represents the practical application of the knowledge taught in the courses of physical pharmacy (DPH 120) and pharmaceutical organic chemistry (DPH 121). The course is designed for both Arabic and non-Arabic speakers to enable them to communicate in health professional settings. Many role plays will help students of basic and advanced levels at the same time to understand each other’s problems while speaking to the person with language limitations of any kind. Course will enable non-native speakers to acquire basic knowledge in greetings and simple communication with patients. All students will function as an effective team member and contribute to peer learning. The course is designed to give an overview of the main topics in behavioral sciences and Ethics including biological basis of behavior, mental processes, sensation and perception, learning, motivation, intelligence, human development, personality, socialization, social groups, changes in trends, problems of determined individual’s and universal ethical principles. The objective of the course is to enable the student to understand and apply the knowledge, skills and attitude developed in this course to communicate effectively. Students will learn and practice strong values, ethical conduct and social responsibilities, especially personal, academic and professional integrity while developing collaboration in diverse team settings. Students will be trained to display sensitivity to cultural, psychosocial and ethical issues. This course focuses on the unique nature of the UAE society and its political, geographical, cultural, demographical, and social aspects. It highlights the Emirati perspective of contemporary global changes. This course allows the students to explore the Emirati society in global context. The students will be able to get an insight into the unique political, geographical, cultural, demographical, and social aspects of the UAE society. They will use this knowledge in their interpersonal dealings with the individual members of this community when they meet them in the work-related settings or the community. Students will develop awareness of cultural diversity advantages and disadvantages and discuss cultural, social and communication sensitivities and will be able to relate themselves to global context. In this introductory course in Biostatistics will cover the basics aspect in statistics which include the types of variables, measurements, descriptive statistics such as measures of central tendency and dispersion, and inferential statistics which as hypothesis, testing of hypothesis using various statistical test, the correlation coefficient and its statistical significance and the basics in regression analysis. This course will help the students to select an appropriate statistical test for analyzing data from different types of research, interpret the result and apply the results to make decisions. This course is designed to familiarize students with the both biological factors and physicochemical characteristics of the drug influence on drug absorption from gastro- intestinal tract; emphasize the importance of dosage form selection and how it affects the clinical outcome. This course deals with the rate processes of drug disposition, derivation of mathematical models to calculate the time course of drug and metabolite concentrations following drug administration. In addition, the course will discuss the pharmacokinetics of drug disposition following one compartment, multi compartment and non-linear pharmacokinetic models for different rout of administration. This course discusses the principles of human genetics with application to the study of biological function. The course covers the major topics in cellular and molecular immunology, including innate immunity, B cells, T cells, dendritic cells, cytokines and mucosal immunity. In addition, the course covers autoimmune, allergic and immunodeficiency diseases, as well as new advances in interventional and clinical immunology and the molecular and genetic basis of immunologically-mediated diseases. An introductory course that deals with pharmaceutical calculations needed in prescriptions and the basic technique of compounding simple aqueous and non-aqueous pharmaceutical solution dosage forms. This course will also introduce the formulation aspects of some dosage forms including: solutions, suspensions, emulsions, creams, ointments and suppositories. Moreover, detailed information will be supplied about quality control tests used in evaluation of each dosage form. This course describes the basic principles covering instrumental methods of analysis in areas of electrochemical, chromatographic and spectroscopic analysis such as the, HPLC, TLC, HPTLC, UV–visible spectrophotometry, fluorimetry AAS, IR, NMR and MS. The applications of these methods in pharmaceutical compounds, dosage forms and drugs and their metabolites in biological fluids are also included. The course represents the practical application of the knowledge taught in the courses of Pharmaceutics 1 (DPH 212) and pharmaceutical analysis (DPH 213). This course provides foundation knowledge and principles of pathophysiology and pharmacology. It also covers pharmacogenomics considerations and applications in individual patient care. It prepares the students for the integrated pharmacotherapy course series. This biochemistry course deals with complete understanding of the molecular level of the chemical process associated with living cells. It provide basic knowledge of the structure-function relationships of biological molecules, especially proteins, lipids and carbohydrates which enable the student to appreciate derangement of function resulting from abnormalities in structures of the biomolecules, it provides Important concepts include bioenergetics, biological catalysis, and metabolic pathways as interacting regulated systems processes.it covers the regulation and integration of major metabolic pathways, roles of enzymes, coenzymes and their mechanisms of action, isoenzymes & its role in health & illness are also highlighted .It covers the chemical structure of vitamins and their rules in health and diseases. Course designed to provide a firm foundation in biochemistry in one semester for understanding the interpretation of clinical Lab Data (PS 333). This course is the first in Professional Skills Series. Skills expected to develop with this course are complimentary to the course Pharmacy & Healthcare. It includes evidence based practice, communication, and drug information skills. This course integrates topics from pathophysiology, pharmacology, medicinal chemistry, pharmaceutics, and pharmacotherapy in renal disease, acid/base disorders, clinical nutrition, autonomic nervous system, pulmonary disease, hematology and immunology and rheumatology. Each disease groups are in modules that contain details of topics from integrated sciences. The course demonstrates the design and formulation of tablets and capsules. Moreover, the course includes an introduction for sterile drug delivery systems, their advantages and disadvantages. The design, formulation and quality control of ophthalmic and injectable dosage forms; including isotonicity as well as sterilization techniques are studied. This course deals with the study of the biological characters of different groups of bacteria, fungi, viruses, and their classification. It also familiarizes the students with the mechanism of action of antimicrobials, antimicrobial sensitivity testing as well as sterility testing. Furthermore, the course deals with the role of microorganisms in infectious diseases. The covered topics include pathogenesis, laboratory diagnosis, prevention and control of the different bacterial, viral, fungal, protozoal and helminths infections. The course represents the practical application of the knowledge taught in the courses of pharmaceutics II (DPH 221) and microbiology (DPH 222). This course is designed to provide the students with a comprehensive overview of key principles related to self-care and the use of non-prescription products. The course empowers the students to engage in health promotion and community engagement activities e.g., smoking cessation. Being highly accessible healthcare professionals pharmacists are placed well in the society to promote health and wellness of the consumers of healthcare. This course trains students to develop certain skills related to pharmacy practice. Skills expected to develop with this course are complimentary to the topics in Integrated Pharmacotherapy I. This course lays foundation for pharmacy research. It includes methods for literature review, ethical principles, terminologies, and basic statistics for pharmacy research. This course is the first in a two-part series of in a real world community pharmacy setting designed to allow the students the opportunity to develop and apply skills based on the knowledge and practice in previous courses. The objectives of this introductory are to develop professional communication skills, acquire knowledge of community pharmacy practice and become familiar with different brand names of over-the-counter (OTC) medications available in the UAE market. In addition, students are expected to dispense prescriptions under supervision of the pharmacist. This course integrates topics from pathophysiology, pharmacology, medicinal chemistry, pharmaceutics, and pharmacotherapy in endocrine system and cardiovascular diseases. Each disease groups are in modules that contain details of topics from integrated sciences. This course enables the students to understand pharmacokinetic basis of drug interactions, effect of various disease states on the clinical pharmacokinetic parameters. The course also covers the methods of therapeutic drug monitoring to adjust the dose of narrow therapeutic index drugs in different patient populations. This enables the student to design dosing regimen in clinical conditions considering the patient, disease, drug interactions and pharmacogenomics factors. The course comprises the knowledge of pharmaceutical plant design, machinery, the theoretical background and practical demonstration of different manufacturing processes like: mixing, filtration, extraction, drying and packaging technology. Moreover, the solution kinetics of drug degradation, rate processes and reaction order for simple & complex reactions are discussed. Models for drug stability that predict the effect of formulation and storage factors on expiration date are also illustrated. This course aims to discuss the components of the pharmaceutical legislations in the United Arab Emirates. In addition, the course will enable the students to adhere to the national and international ethical standards including the Good Pharmacy Practice as they relate to the profession. The legal aspects of starting a pharmacy and its operations will be discussed. This course trains students to develop certain skills related to pharmacy practice. Skills expected to develop with this course are complimentary to the topics in Integrated Pharmacotherapy II. This course covers different methods used in pharmacy research. It includes detailed methods of qualitative and quantitative research designs. The supporting biostatistics is also discussed. This course integrates topics from pathophysiology, pharmacology, medicinal chemistry, pharmaceutics, and pharmacotherapy in cardiovascular, neurological and psychiatric diseases. Each disease groups are in modules that contain details of topics from integrated sciences. This course covers the principles of the prevention and management of poisoning and drug overdoses. The course detail the concepts and practices of pharmacovigilance nationally and internationally. It also discusses on methods to establish pharmacovigilance operations in a hospital setting. Role of pharmacists in patient safety is also covered. This course covers healthcare system deliveries and indicators for measuring the value of the system. The roles of different stakeholders in the healthcare system, including the international health agencies, Ministry of Health and Prevention, healthcare providers, health insurance organizations, and the consumers in developing health policies and efficient delivery of healthcare services are discussed. Students also gain an understanding of the leading policies that govern the pharmacy profession and its influence on the global healthcare delivery. This course covers the common medical and healthcare issues in special populations. It include altered drug pharmacokinetic and pharmacodynamics of drug in the special populations like pediatrics, geriatrics, obese, pregnant or lactating patients resulting in altered drug response and drug safety issues. Moreover, the course gives the concepts of tailoring the pharmacist provided services, including the counselling, considering the patient diversity in the society. The course prepares the students to plan and proceed with population specific approach to the common disorders. This course is designed to introduce students in their third professional year to Phytopharmaceuticals & dietary supplements utilizing an evidence-based approach and an overview of micro and macro perspectives of Complementary and Alternative Medicine which will enable the students in making rational decisions while advising patients. The focus is on herbs with proven clinical efficacy and discussions will include plant name, part used, adverse effects, contraindications, potential drug interactions, dose, mechanism of action and clinical evidence. A comparison between herbal preparations and other drugs in the management of specific conditions will be included to stimulate rational and evidence based approaches to therapeutic recommendations. This course trains students to develop certain skills related to pharmacy practice. Skills expected to develop with this course are complimentary to the topics in Integrated Pharmacotherapy III. This course covers critical appraisal of pharmacy literature. It will allow the student to read article from high and moderate reputation journals in pharmacy field and learn how to do full critical appraisal to be able to choose the best resources for information needed for the future recommendations in practice field. This course will make the student able to plan to do a research, write research proposal and submit for ethics approval. This course is the second in a two-part series of at a real world practice environment, but this time in an institutional pharmacy setting. The student will gain an appreciation for the profession of pharmacy with exposure to the real patients and develop professional attitudes, judgment and skills needed to function in this setting. This introductory pharmacy practice experience will smoothen the transition of the students from didactic learning to the exclusive experiential learning in the advanced pharmacy practice experience. This course integrates topics from pathophysiology, pharmacology, medicinal chemistry, pharmaceutics, and pharmacotherapy in oncology, hematologic malignancies, hepatic disorders, GI disorders, women’s and men’s health. Each disease groups are in modules that contain details of topics from integrated sciences. This course covers the economic, clinical, and humanistic aspects of healthcare interventions, reflecting on health technology assessments. The course explains the methods to measure costs and outcomes in micro (clinical) and macro (administrative) economic levels. Different stakeholder perspectives and economic frameworks for the evaluation and interpretation of pharmacoeconomic analyses become center part of this course. Pharmacoeconomic modelling is also discussed. The course includes the design and formulation of nanoparticles and nanovesicles and their application to enhance drug solubility and dissolution. Moreover, it contains the formulation and delivery aspects of transmucosal, transdermal and site-specific drug delivery systems. Also, the course includes the fundamentals of biotechnology derived pharmaceuticals and also covers existing current manufacturing technologies like automatic process control and software systems in industrial settings. This course covers essential pharmacy practice managerial skills including personnel and product management, addressing workplace conflict, continuous quality improvement, and leadership. The course places special emphasis on how to receive and respond to different types of patients in a pharmacy. The course builds upon these skills in the development of a business plan to implement an innovative pharmacy service. This course trains students to develop certain skills related to pharmacy practice. Skills expected to develop with this course are complimentary to the topics in Integrated Pharmacotherapy IV. This course covers aspects of conducting research. Students are expected to conduct research under supervision. The research shall be completed in this course or continued to scholarly pathway V.
This course integrates topics from pathophysiology, pharmacology, medicinal chemistry, pharmaceutics, and pharmacotherapy in infectious diseases. Each disease groups are in modules that contain details of topics from integrated sciences. This course trains students to develop certain skills related to pharmacy practice. Skills expected to develop with this course are complimentary to the topics in Integrated Pharmacotherapy V.
This covers preparation of research report, preparation of research presentation for an appropriate conference and preparation of manuscript to be published in an appropriate journal. If the research undertaken in Scholarly pathway IV is long, research could be continued, but an interim report, presentation, and manuscripts should be prepared. The course covers essentials of pharmaceutical marketing based on fundamentals of marketing sciences. Essentials of how to connect to customers and brand building are discussed. Communication in pharmaceutical marketing is emphasized. This course focuses on knowledge of drugs using in sports by the athletes and other person. It studies the perspective of International and national regulation of drug use, monitoring, testing and legal aspects of drug use in sports. This course will allow the student to explore the perspectives of the role of Athlete Support Personnel. This course is designed to explore the scope of clinical problems related to parenteral nutrition and intravenous therapy. Students will be taught the rationale of using various intravenous therapy and parenteral and enteral nutritional therapy with their advantages, disadvantages, complications and monitoring parameters. This course is designed as a companion to all APPE experiences. During APPE, the student will identify a question that needs to be researched. Upon approval of the faculty supervisor, the student will research the question through systematic review of the literature following an evidence based practice approach. The student will deliver a presentation on the approach to answering the question. The presentation will be made before an audience of students, faculty, and practitioners. This advanced pharmacy practice experience builds on didactic courses and introductory pharmacy practice experience about how to manage pharmacy operations. Based on current standards of pharmacy practice, efficient operations in both administrative and clinical levels will empower students manage pharmacy. Students will work on operations that interlinks with other departments in the institution. This advanced pharmacy practice experience in a community pharmacy setting builds on the abilities acquired from didactic learning and introductory pharmacy practice experience. It provides training in community pharmacy with opportunities to interact with public. The experience covers pharmacy management, dispensing process, patient counselling, and related services through community pharmacies. This advanced pharmacy practice experience in an ambulatory care setting builds on the abilities acquired from didactic learning and introductory pharmacy practice experience. It is a combination of 2 rotations with same objectives to provide sufficient training in ambulatory care practice. This advanced pharmacy practice experience in an inpatient setting builds on the abilities acquired from didactic learning and introductory pharmacy practice experience. It is a combination of 2 rotations with same objectives to provide sufficient training in inpatient pharmacy practice. The student will be involved in the practice and interact with professionals and patients. This advanced pharmacy practice experience is to enhance expertise in the management of medical/drug informatics. It imparts an advanced ability to retrieve, analyze, and communicate appropriate information on medications and health care issues to pharmacists, physicians, nurses, other healthcare professionals and the patients. The purpose of this rotation is for students to learn about the functions and activities of pharmaceutical manufacturers. The Pharmaceutical Industry rotation will afford students the opportunity to be exposed to different departments within the organization in order to gain a better understanding of the role of the pharmaceutical industry in the provision of healthcare. The advanced pharmacy practice experience provides a student with experience in the pharmacotherapeutic management of infections in direct patient care. The activities of the experience are to build upon abilities acquired from didactic learning and introductory pharmacy practice experience to provide services to patients with infectious disorders. The advanced pharmacy practice experience provides a student with experience in the pharmacotherapeutic management of cardiology patients in direct patient care. The activities of the experience are to build upon abilities acquired from didactic learning and introductory pharmacy practice experience to provide services to patients with cardiovascular disorders. The advanced pharmacy practice experience provides a student with experience in the pharmacotherapeutic management of psychiatric patients in direct patient care. The activities of the experience are to build upon abilities acquired from didactic learning and introductory pharmacy practice experience to provide services to patients with psychiatric disorders. The advanced pharmacy practice experience provides a student with experience in the pharmacotherapeutic management of oncology patients in direct patient care. The activities of the experience are to build upon abilities acquired from didactic learning and introductory pharmacy practice experience to provide services to patients with cancer. The advanced pharmacy practice experience provides a student with experience in the pharmacotherapeutic management of pediatric patients in direct patient care. The activities of the experience are to build upon abilities acquired from didactic learning and introductory pharmacy practice experience to provide services to pediatric patients. The advanced pharmacy practice experience provides a student with experience in the pharmacotherapeutic management of geriatric patients in direct patient care. The activities of the experience are to build upon abilities acquired from didactic learning and introductory pharmacy practice experience to provide services to old patients.